Hello there, I’m back. 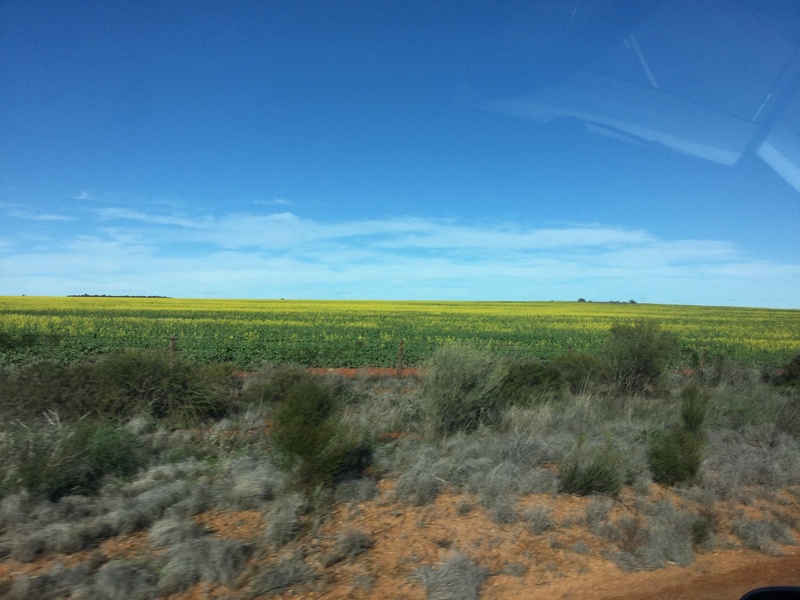 I’ve been a bit slack with my writing since we arrived in Perth nearly two weeks ago, and as my friend Yvonne said to me today I must be having too good a time to sit down and finish this blog. Anyway here it is. 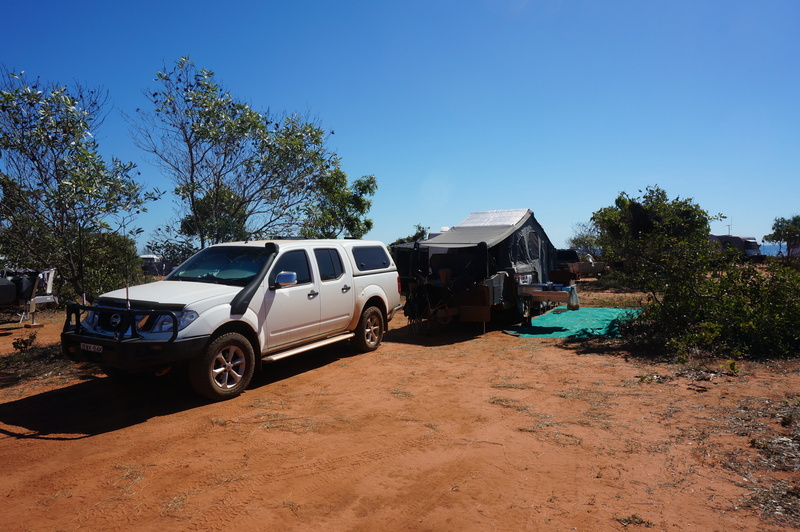 After our ‘Once in a Lifetime’ adventure at the amazing Horizontal Falls our thoughts were to head to Cape Leveque with some free camping along the way. I’m not really a beach swimmer, I will admit that the waves scare me, but I do like to walk on the beach to collect shells and rocks and paddle in the rock pools. After a quick diesel top up and a bite of lunch we hit the sandy track to the Cape where we were going to check out a couple of free camps along the way, Quondong Point and James Price Point. As Quondong was first we turned in to take a peak and were greeted with a beautiful view of the Indian Ocean. The day was clear, hot and calm and this was where we decided to stay for a couple of nights away from everything except the ocean and a handful of people that were friendly but not on top of us. Our camp was right on the ridge overlooking the beach. to our amazement and excitement we managed to see few giant sea turtles breaching the waves but it was quite difficult to get decent photos at such a distance. Our afternoon was filled some walks on the beach, a chat with the boys while we enjoyed happy hour and a beautiful sunset on the horizon. As night fell we enjoyed the sound of waves crashing on the rocks below and an amazing starry sky above. Sleep didn’t come too easily for me that night as it’s usually quiet for us and I’m not used to beach noise. It became quite windy with a huge tide that produced bigger waves with plenty of noise due to the proximity of our camp to the beach. Saturday morning we set off early for a walk. It was a little calmer than the night before and overcast when we left camp. The beach was cluttered with plenty of shells from the dumping it received the night before and the rock pools were full. As the morning wore on the sun appeared as did the wind, which became quite blustery as we returned to the trailer. Not being prepared for the wind or sun while on our walk we became quite sun and wind burnt, not like us at all. We had made an extensive hoard of shells while on the beach though which we were pretty chuffed with and saw heaps of hermit crabs along the sand. After another walk that afternoon the weather turned quite blustery and it became quite clear that it wasn’t going to improve but get a whole lot worse through the night. As the camper trailer creaked in the wind I began to think it wasn’t so good to be so close to the edge. The next morning we were told by our neighbours that a severe weather warning had been issued for the coast and once again we had been in it. Sleep deprived after a rough night and ready to move on we packed up finding it quite difficult with the wind billowing the tent on the trailer and making folding up hard for us. We didn’t head to the Cape after this, instead opting to move on to Barn Hill which is about 120km south of Broome (where we had popped into for some supplies and voting). Barn Hill is situated on Thangoo Station, a working cattle station, which stretches 85kms along the coast between Broome and Port Headland, running 8,000 head of Braham cattle. It was here we met up again with our good friends Kay and Ian Power and new friends Roger and Lyn. Set up at Barn Hill. We settled in quite happily here, first booking in for two nights then extending to four. Each day we walked along the beach adding to our cache of shell and beginning a rock one as well. The rock formations here were absolutely amazing and each day we would discover another little niche around the corner. The daytime temperatures were still very warm and the nights were comfortable. Dinner was shared each evening with our group of friends followed by a game of canasta, which Murray and I adapted to playing quite quickly. Many laughs, drinks and stories were shared each day. Our toilet and shower blocks were open air which was quite refreshing after a warm day on the beach or around the caravan park and we very rarely needed to use the hot water with the heat. Lawn bowls was quite popular here and it was fun to watch, players were barefoot on a sandy green and no uniform was required. We enjoyed a homemade ice cream in a cone and iceblocks each day to cool off. Murray even went fishing with Ian and Roger one afternoon, but he preferred to be taking photos than holding the rod. The fish were going off while we were there, it was common to walk on the beach and catch the sight of someone reeling one in, their smiles were priceless. Eating the fresh fish was even better and we were able to do that a bit with Ian and Roger having regular success. Queen, Spanish mackerel, whiting and threadfin salmon were the popular catches of the day while we were there. The station staff made regular deliveries of fresh sausages and mince, vanilla slice, bread and lamingtons to the shop each morning, all of which were made on the station. We bought some of the sausages to take with us when we left and discovered them to be the best ever, no preservatives and absolutley no fat in them, better still was the fact that they didn’t upset my reflux when I ate them. Moving on was a decision that held some trepidation for us as we were leaving our friends, not knowing when we would catch up again and not sure where we were headed next, only knowing that we were now heading south towards Perth and it was going to cool off soon. So much more to see and do though so we needed to get back on the road of adventure. 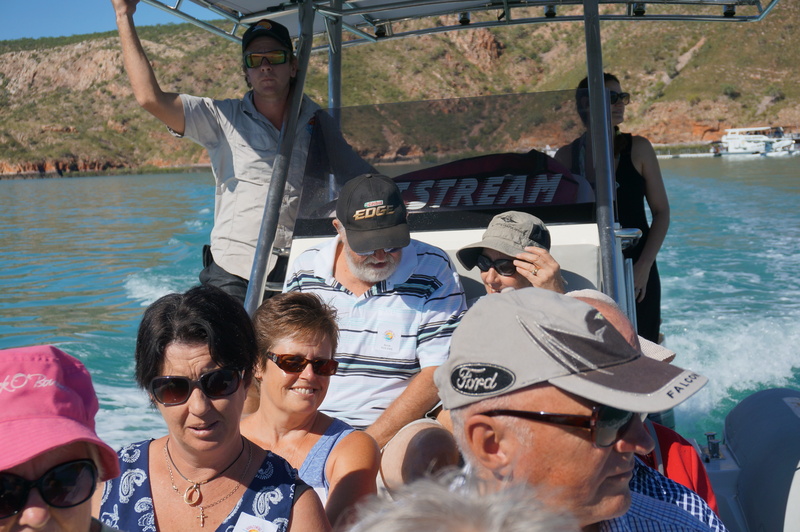 We returned to Derby on Monday 20th June to spend the next five days relaxing, sightseeing and for our adventure to the Horizontal Falls. 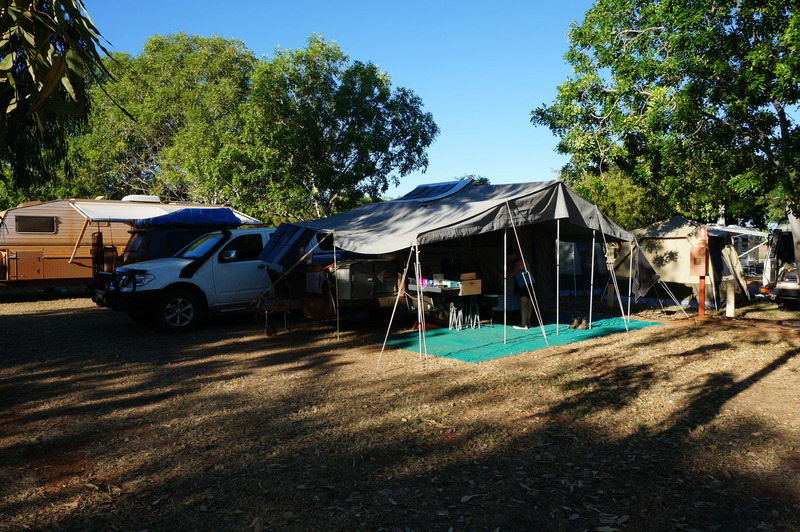 Our home for this time would be the Kimberley Entrance Caravan Park where we had a very spacious site and once again, good neighbours. Tuesday morning we were up and raring to go. 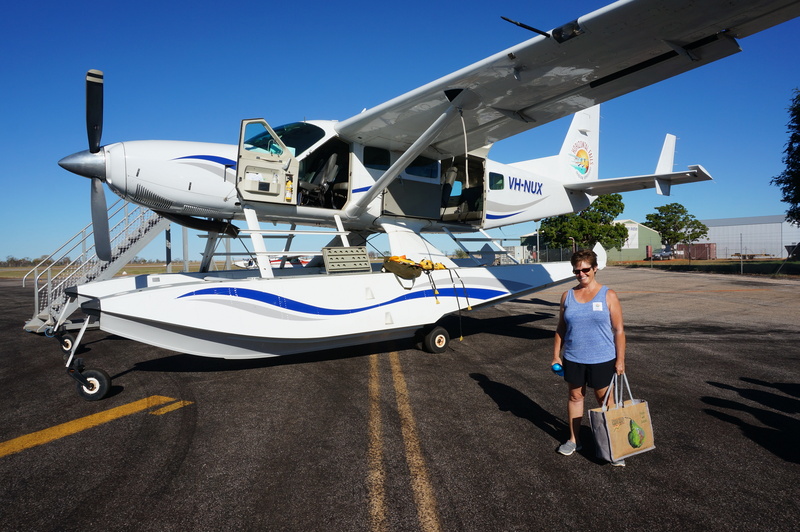 The bus picked us up at 8.15am and took us to our waiting sea plane at Derby Airport. The flight was so smooth. Take off and landing were too easy. I thought landing on the water would be rough but it was smoother than on land. Before take off, not real sure how this will go. Our flight into Talbot Bay took us over the falls we were to ride through that day and from above they didn’t look too bad, but it was low tide at the time. Arriving at the jetty in the middle of Talbot Bay we were quickly greeted by Adrian, our boat skipper and guide for the day. He put us straight through our safety talk and got us all into the boat immediately as the tides were to be big that day because of the winter solstice, shortest day of the year 21st June, so we didn’t have time to think of anything other than holding on tight. Murray headed to the front of the boat but I didn’t follow as I wasn’t real sure so remained at the back. There were twelve of us on this little boat and it certainly had some grunt. We sat astride our seats like we were on a horse with a ‘hold on tight’ bar in front of each seat, which quickly became my best friend. The ‘yeah, I’m ok’ look. On the ride out to secure our bags at the lunch mooring and get safety jackets on we were told all about the Sharks and crocs in the water and how important it was to stay in the boat. Hmmm, now I’m starting to wonder what Murray has got me into. The water was beautiful, the sun was heating up and my heart was pumping as we headed out to the falls for our first run. I could see Murray up front with a grin from ear to ear, he was pumped and loving it. We met up with another boat that was sitting in the first section of falls which was the wider of the two, 10 or so metres wide. Adrian backed our boat in next to them and you could feel the rush of the water pulling and pushing against the boat and this was only low tide still. Through we went backwards and then forwards. The force of this water was unreal. Then we were taken on a trip around the cove between the two falls taking note of the watermarks on the walls that were up to 11 metres high when tides were well in. We then passed through the narrower falls, about 7 metres wide and the water really was strong here. My heart was pounding after a few passes in and out of these massive sections of water, I think I was more concerned with the boat tipping over than anything, in the rush of this water. ..oh and the noise of the water surrounding me, and the speed of the boat and ….the list goes on. 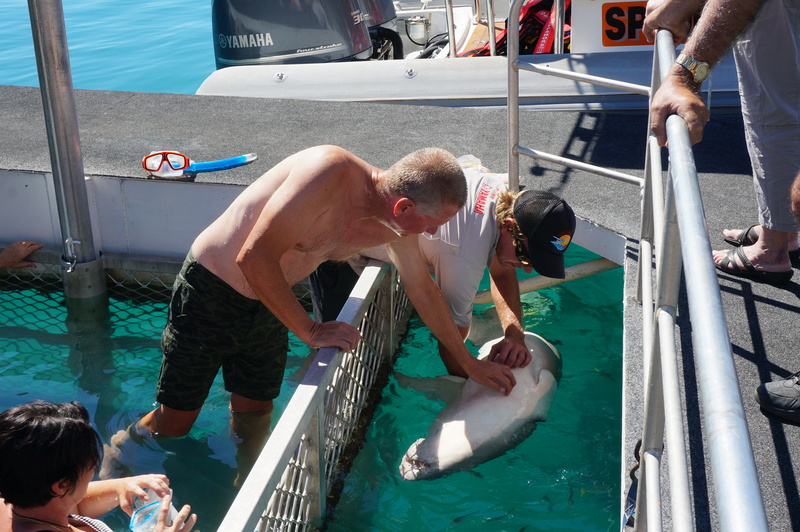 After a few passes in and out of the falls we returned to our mooring for some morning tea and a swim with the Sharks. What???? A caged of area was set up for us to swim in with the Sharks fed on the other side. They weren’t great whites but were still intimidating. Murray had a play with them, not me. Lunch was back on deck with young Grace cooking up a storm at the BBQ of Barramundi. It smelt fantastic and tasted even better with a lovely couscous salad and tossed salad plus a bread roll if you wished. Wow, my mouth waters just thinking of it again. We were taken back out to high tide at the falls after lunch, another thriller of a ride with the roar of the water so much louder now, and then on a tour around all the hidden coves in this amazing part of the country with rock formations full of colour and character. 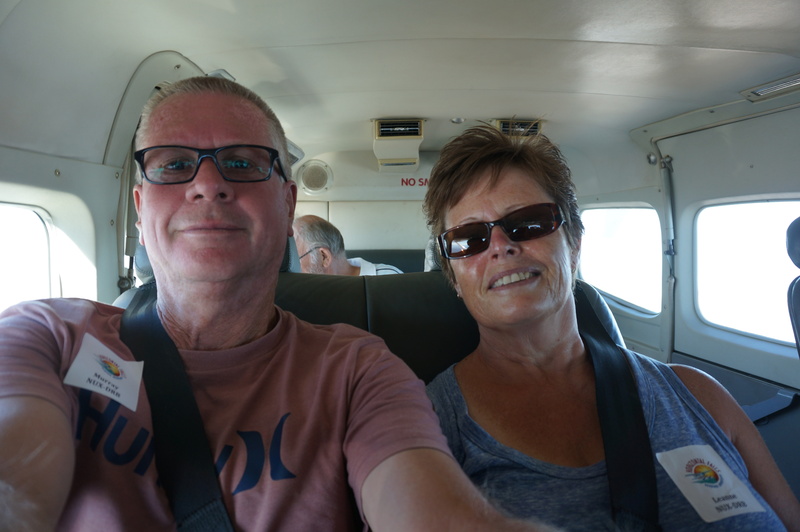 Our flight home took us out over the Bucaneer Archipalego and the barramundi breeding tanks. It was good to be back on solid ground after an awesome day in which I overcame some more fears, although timidly. Back at the caravan park we caught up with some people from our day and relived our memories we had all made. It truly was an amazing day. The next day, Wednesday, was about washing and catching up on some R&R in the park along with some tidying up in the car and trailer. It was another hot day but we did manage a walk around the streets of Derby for some exercise. 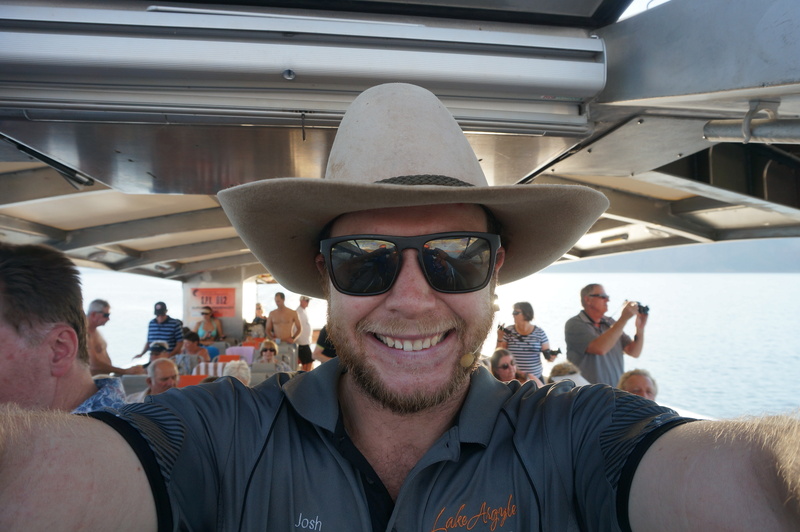 Thursday I had a haircut and then we set out on some sightseeing visiting the Prison Boab tree, the old gaol, the longest water trough that can take over 500 cows at once and taking in a sunset that evening down at the wharf where eleven metre tides can be expected at times. Friday we stocked up the groceries ready to hit the road once again and we caught up with our niece Bethany and her family (whom we were to visit in Pannowonica on our way down the coast) for the evening before they hit the Gibb River Road for their few weeks holiday. Saturday morning we packed up and set off towards Cape Leveque unsure of where we would be that night but sure it would be somewhere new and memorable. Off the Gibb and back to reality. We needed some power and Internet. Topped up again with fruit and vegetables and a lovely lunch with Kay and Ian, we left Derby and headed to a freecamp along the road towards Broome that had been recommended to us by neighbours at Windjana. 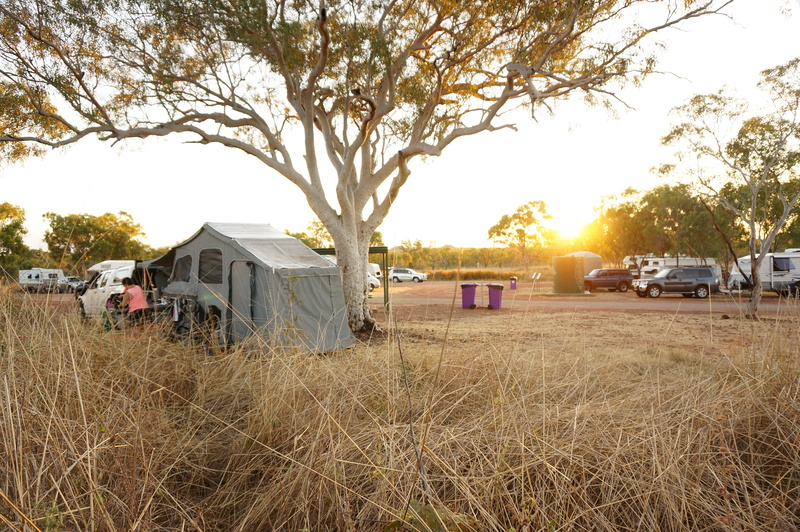 Tumble Goodine was its name, a bush camp on a property off a side road on the Fitzroy River a few kilometres up the road from Willare. Opening the gate to this place gave me a few doubts as to what it was going to be like. The road in had been churned up by people coming in to fish on the property and having fun in the recent wet, so this made the road very interesting to manouvre through. I didn’t enjoy this drive at all as it also had a few ups and downs that weren’t that friendly. Murray had to get out several times to clear tree branches off the path in front of us and walk ahead to find the path between overgrown trees. I kept telling him there was no way through but he’d find one. There were fences down and barbed wire on the track. We arrived at the spots we were told about. They were way too isolated for me and near the river where there was a resident salt water croc, so we were told. The bush land was thick so I felt it was not that safe for a fire. Murray took a look around, checked my face and said maybe it was better to move on if I wasn’t going to rest easy here. Phew! No photos we taken here as I wasn’t keen and Murray wasn’t real impressed with me, just use your imagination. Back out we went with me gritting teeth all the way. 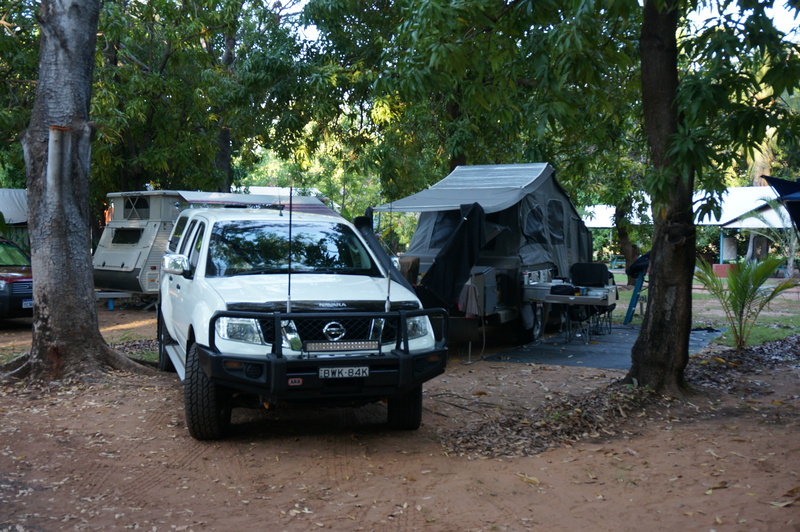 Further up the road, about 100kms from Broome, we found Nullibubicca Rest Area and pulled in there. Down by a fence was a lovely quiet spot so we set up for the night. A few other cars pulled in near us and we met two backpackers who had been picking fruit in Orange on their trip, then met Emma and Christina from England whom we quickly began chatting with, even inviting them to join us for happy hour, our shout, as they had no fridge with them. Really lovely and friendly girls, 21 & 23, with good heads on their shoulders. 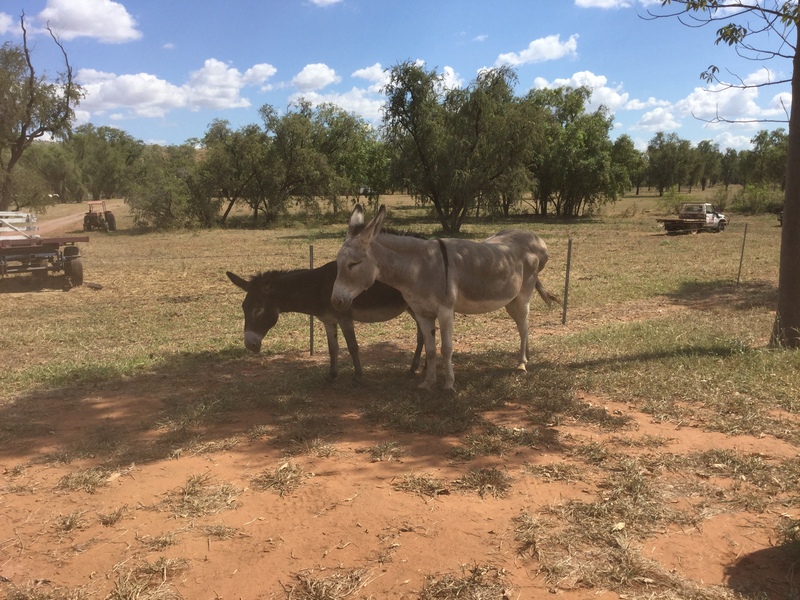 They were waiting here a few days to hear about a job in Mataranka which they had applied for. A couple of days after we left they messaged us to let us know they were successful. Well done to them. Murray admitted we were lucky to have come here in the end, much more friendly than the other spot and we met these two girls. Happy hour with Christina and Emma. 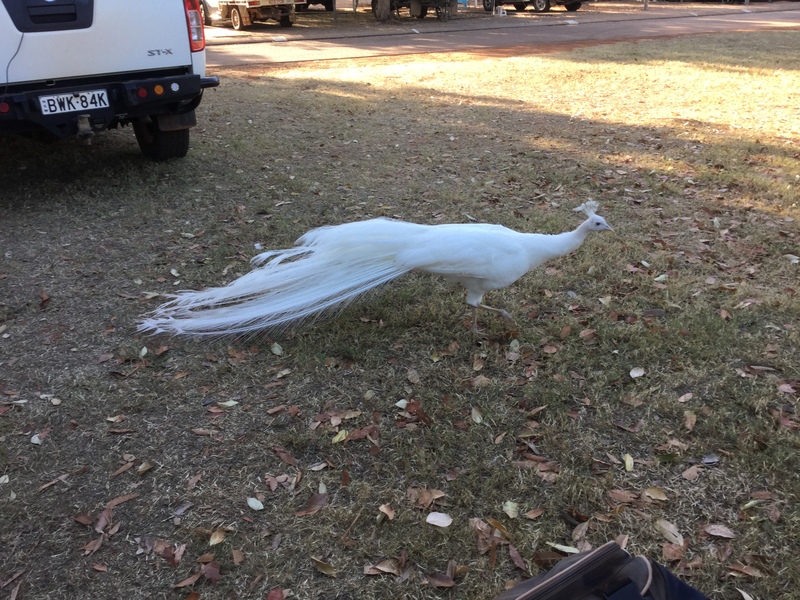 We arrived on Friday 17th June to another hot day in Broome, although the temperatures had dropped to low thirties mostly and the nights were cooling off to 18s, which was good for us as the past month had mostly been 37 with lows of 25. Tarangau Caravan Park was well set out with clean ammenities and the sites were shady enough. Our site was powered and we weren’t crowded by our neighbours as we were at the end of a row and facing a different direction. Heading out for a look around we went to Cable Beach first. The water was that lovely turquoise and the sand was white. It looked like a postcard with the red rocks of the Gantheaume Point in the background. Sunset would be lovely here so we would come back for that. We went for a walk down at the Port where road trains were delivering livestock for export. Part of the jetty was being refurbished so we couldn’t walk right out but it was a lovely view back to the beaches and points. Gantheaume Point was just beautiful, everywhere we looked there was a myriad of colour with all the rocks, sky and water surrounding the point. Murray decided that we would come here for a sunset and happy hour the next night. After getting the rest of our groceries we returned to the camper for dinner. Saturday we got up early as usual and headed to the Courthouse markets, we were hoping to meet Kay and Ian there as they were arriving in Broome that morning, and we did. There were plenty of goodies and wares being sold, from handmade to commercial, this market had it all. Of course, I beelined for the homemade goodies and Kay and I enjoyed taste testing all the chutneys, pickles, dukkahs and sauces as well as smelling all the candles and soaps. I had to be careful because anything I purchased had to make it back home yet. Murray and Ian had a bit of a look around but were still in the same spot we had left them when we returned. All of us enjoyed some morning tea with fresh ground coffee for Ian, Kay and Murray and handmade lemongrass and mint tea for me. We returned to our caravan park for lunch and then did some sightseeing with the Powers. Murray was the guide as we had already seen quite a bit the day before on our little tour and he impressed Ian with his intake and bearings of the local surroundings. That evening we returned to Gantheaume Point for our sunset happy hour with Ian and Kay. We had our wine, beer, nibblies and cameras ready for a great time and it was, with plenty of laughs shared, photos taken and memories made. We met a lovely young lady there, Megan, who was into photography and happily gave the men tips on angles and lighting. Plenty of people made their way down to this spot and it didn’t disappoint anyone with a spectacular sunset that evening. Sunday, 19th June, my birthday. I am so lucky to have been in such a special part of the country for my birthday this year. It was a far cry from the sad one of last year as I had lost my beautiful mum on the 17th, two days before. Mum and dad had both been on my mind over the past few weeks (8 years on 4th since I lost dad) and I often wonder if they are enjoying this journey of ours from above as they are with me in my heart everyday. Nothing planned for today I just wanted to relax, do some blogging and talk to our boys on FaceTime. It was made even better though as I not only saw the boys but Kev, Bec and Allira too and I got some lovely surprise phone calls from Scott and Kylie and several family and friends which I hadn’t expected. An afternoon dip was enjoyed at Cable Beach and Kay and Ian had organised a birthday cake and drinks at their van for that afternoon, another thoughtful surprise. Dinner was at Zanders on Cable Beach where I got to enjoy some excellent barramundi with my wonderful husband. All in all a very special and relaxing day. What a life. Monday, 20th we said farewell to Kay and Ian yet again but knew we would run into them while on the West Coast somewhere. 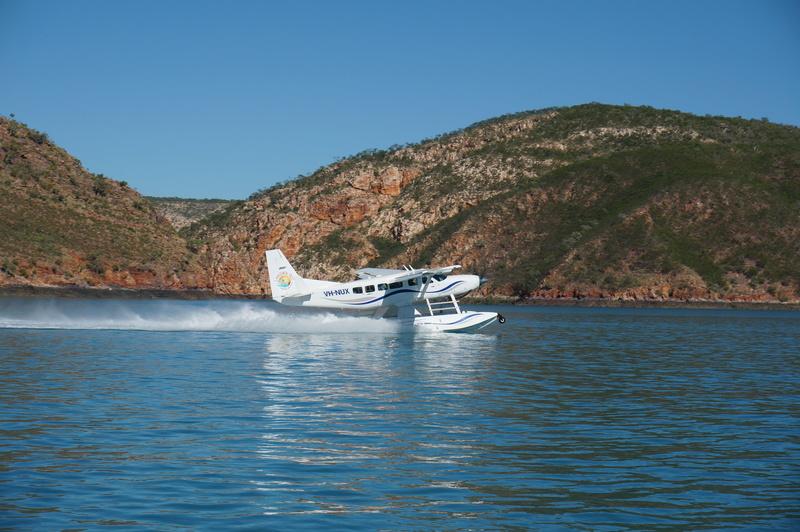 We headed back to Derby to stay for five nights as we had our Horizontal Falls trip on the 21st and our niece Bethany and family were arriving on the 24th on their way to the Gibb River Road. We departed Manning Gorge on the 10th June and pointed the car in the direction of Silent Grove. Along the way we did a quick stopover at Galvins Gorge which is a short 1.5km walk from the road in. It was very peaceful, the water was cool and clear. A swim would have been nice but we didn’t have one, not sure if you can and we wanted to get to Silent Grove. The roads had improved since Ellenbrae much to our pleasure, we had no further problems with the car or trailer. Silent Grove is run by the National Parks, fees are $12 per night per person and a $12 vehicle fee also has to be paid. The campgrounds are very spacious, plenty of trees, with a generator area separate from the quiet area where we camped. Showers blocks have about four showers in each and toilet cubicles are seperate in single blocks. All were very clean. The water is fresh spring water from a little Spring just near the campgrounds. We still boiled it up before use, just in case. It was hot and a little dusty when we set up but we had some shade. There is no power here at all so solar was very popular. We once again ran into our fellow Albion Park friends, Gaye and Richard, which was lovely, and also Marco and Donna from Mareeba whom we had met at El Q. Small world really. This place had a lovely ambience about it, there were lots of campers both nights we were there but it wasn’t a noisy place. Everyone was generally in bed before 9.30 and up early in the mornings with the sun searing through. Morris camp at Silent Grove, Murray relaxing. Bell Gorge is about a 10km drive on a not so rough but dusty road. It is a forty five minute walk into the gorge and to the waterfalls, but it is so well worth it. We began at 7.30 because it was going to be another hot day. A tough walk in places with a water crossing that was a little slipperyin places, we wore our wet shoes through here because there we no stones out of the water so we were bound to get wet feet. There were places along the edges of cliffs where I was hanging on tight with my little fingers. I also had to sit and bum shuffle over some large boulders and squeeze through some more narrow areas but I did it with Murray encouraging me all the way. When we reached the top of the gorge and climbed down into the swimming area it was absolutley breathtaking. A picturesque place indeed. Once again fresh clear water, it was a little colder that any other hole we had swam in to date. It was only us there for a short time and it was so peaceful away from the world. After a swim, we enjoyed our oranges and a rest, then headed off on the climb back out. What an accomplishment I felt we had achieved. I was pretty proud of myself this day, pushing myself to do something that I wouldn’t normally do as this was harder than other gorges we had done. Murray was impressed with me too because I didn’t back down from the challenge. In camp later that afternoon we spent a pleasant happy hour with Gaye and Richard and after dinner sat around a campfire with our neighbours enjoying some more company of fellow travellers. We would highly recommend Silent Grove and Bell Gorge. On we travelled the next day, 12th June, to Mt Hart Wilderness Lodge, located in the heart of the King Leopold Range Conservation Park where the rock formations were now black dolerite, no longer red ranges. The camp here was another bush camp set on the banks of the Barker River, with spacious camp spots, all unpowered, and clean, roomy ammenities. The drive in is fifty kilometres off the main road with about seventeen creek and river crossings of which eight were wet. We stopped along the road to get firewood as we wanted to do our curry in our camp oven for dinner even though it was too hot to enjoy a fire still. Murray got the coals just right and put them in the hole he had dug, we popped our oven on top, covered it in coals and waited. It smelt fantastic and tasted even better when we sat down to enjoy it that evening. It was a very peaceful camp the first night as there were only six lots of campers, possibly due to the long drive in off the main road. The only annoying thing was the amount of flies which we had not had anywhere else. We finally met a couple we had seen at Silent Grove, Michael and Karen, they were lovely and were travelling our direction after this too. That evening a young couple pulled in just near us. We began to chat and found out they were from Orange. Their names were Brittney and Mitchell, they had a little girl Addy. Turns out they know my cousin Mark’s daughter Liz and also his son Ben. The world just got smaller. Wow, fancy meeting someone who knows my family all the way across the other side of the country. There are a few swimming holes at Mt Hart such as:- Annie’s Gorge which is only a little plunge pool but quite pretty; Mt Matthew Gorge, a twenty minute walk along a dry rocky creek bed which you follow upstream, a bit of rock climbing till you reach the waterfall and waterhole, this was very pretty; Barker Pools where you can swim and fish, only a fifteen minute drive from camp. We didn’t swim in any of the waterholes as I didn’t find them too inviting, they weren’t as clear as the ones we had been used to. On the evening of the 13th we had booked dinner at the restaurant up at the homestead. We took the trip across the airstrip and up the hills, about 1.7kms, to the sunset viewing area on Sunset Hill. Another sunset, I know, but it was a lovely spot with a beautiful outlook over the Station. While there we met Kay and Rod, Kevin and Evelyn from Perth and shared happy hour and a stunning part of the day. At dinner we joined this same group of friendly people and had a scrumptious meal cooked by Chef Brad, served by Roberta and Marcus. Starter was homemade ciabatta with fresh chilli and lime hummus. Entree was pea and ham soup, not usually my fave but I enjoyed it. Main was lamb roast with all the trimmings including fresh mint sauce. Dessert was cinnamon tea cake, stewed pears and vanilla bean egg custard. Mmmmm. We were so full but satisfied. 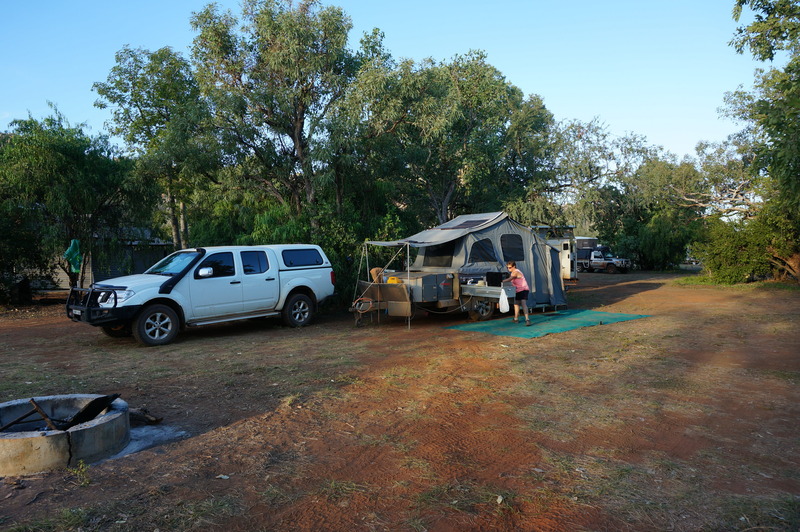 When we returned to our camp we found that the traditional owners of the land had moved in for the night and there were plenty of them, but they didn’t cause us any angst. Windjana Gorge is about 86kms from Mt Hart turnoff. Our plan was to spend two nights here which we did. As we headed towards Windjana we passed through Queen Victoria’s Head and the Napier Ranges. Wow, what stunning rock formations and colours. 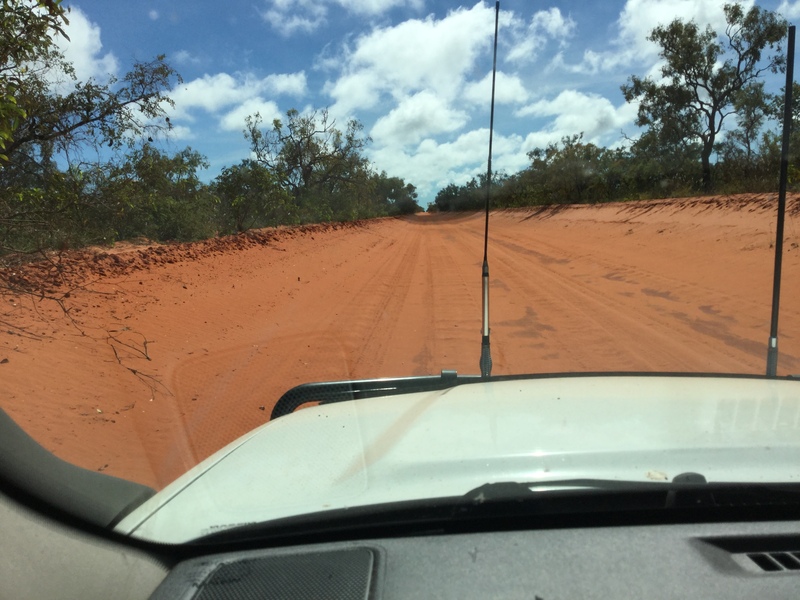 the road into Windjana is quite corrugated and unrelenting to some poor people though. Just when you when think you’ve seen every rock formation there can be, up pops the stunning walls of Windjana. Black, red, orange the colours take your breath away. Massive walls of rock all the way to the sky, almost. The campgrounds here were the same as Silent Grove with the same prices as they’re run also by National Parks. They have two completely separate areas for generators and quiet camping with a day area in between so you don’t even hear the noise from the generator camp. Still warm so it was great to have some shade for at least half a day, need it to top up solar. After a cuppa we headed to the gorge for a look as it was only a fifteen minute walk from our campground to the beach within the gorge. The full gorge walk of 3.5kms is not totally open at the moment, not sure why, but we enjoyed the trek in along the Time Walk which takes a look at marine life forms fossilised within the limestone of the gorge walls. We saw some sort of fossilised fish from the Devonian times preserved in the limestone walls as we passed through. It was interesting for children to see. This gorge has been carved by the floodwaters of the Lenard River through the Napier Range. The walls look so smooth but when you feel them they’re rougher than you realise. Freshwater crocodiles are abundant here as are their food the Archer fish. On our first afternoon, around 4ish when we returned from Tunnel Creek we only caught a few freshies lolling in the water. Would have to come back in the morning. Tunnel Creek was something you could do at anytime of day so we headed out after setting up to tackle it. It was a rough drive out along many corrugations. I wasn’t too sure of this walk as it was in the dark of a tunnel and it was in water. We had bought our wet shoes to do this one so I thought I might as well give it a go. Luckily for me some of the water wasn’t more than knee deep, on me, shins on others, the rest was lucky to be ankle deep mostly. The tunnel is up to 12 metres high and 15 metres wide in parts and at the centre the roof has partially collapsed and is where the fruit bats often take roost. It is not possible to do this walk in the wet season. Murray had his headlamp on and I had my trusty torch, or so I thought. As we found on our walk through there are a few little freshwater crocs but they are more scared of you than the likelihood to bite someone. I wasn’t taking my chances though so I hurried through each section. After walking through the deepest section Murray says to me did I see that little fellow over there and sure enough he got it on camera. I didn’t think it was too little. Then as we looked around we could see many little red eyes in the dark looking back at us. Glad I hadn’t realised earlier. On our return to the beginning, our now exit my torch went dead, which did not impress me at all. I took the headlamp and semi led the way for Murray. When all is said and done I actually did enjoy myself in there, it was a different feeling, I would t say an easy one. I was glad to get back out into the sunlight at the end though and back to the car although it was cooler in the tunnel. Windjana never ceased to amaze me. Not just because of the colours and look of the rock formations but the serenity of the place. It is just so peaceful. You feel like you are on another planet away from anything with not a care in the world. Just you, the peace and the crocs, which I might say were numerous when we returned the next morning to see them, around nine. They were beginning to surface on top of the water and some on the banks of the river, and as the day went on they came out in their numbers. We returned to the beach at oneish, after lunch, and I counted around 150 then struggled to keep count. They were everywhere along the banks, surfacing all the time from the water. You’d see bubbles then pop another one had appeared. Watching them was so relaxing as they weren’t worried about you and if you keep your distance you haven’t got to worry about them either. We could have stayed the forever watching them. Spectacular. Exhilarating. My heart was pounding being so close to these beasts of time. Once again we had made friends with new people and met up with others we had already met along our travels, Michael and Karen from Silent Grove, Marcus and Donna from El Q. On our last trek into the gorge we ran into another couple from Orange with three children, who turned out to live at Nashdale and she was Erica from Nashdale Hall, there goes that world again getting smaller everyday lately. Our neighbours, Theresa and Mick, were there the two nights, they were lovely and made our nights more pleasant with our chats and laughs. After two magical nights and days at Windjana we were heading to Derby where we desperately needed to restock our fridge and pantry, we were out of fruit and veg, without these essentials life isn’t the same. It is an accomplishment to have driven this road and survived, we have evidence of that. When we reached Derby we got reception and found out our friends Kay and Ian were in Derby too so we met up with them and had a most enjoyable lunch at The Kettle Cafe. As we had a few days to kill before we needed to be back in Derby for our treat on the 21st we decided to head to Broome for a few nights. Ian was pretty chuffed with the presentation of his sausage roll. 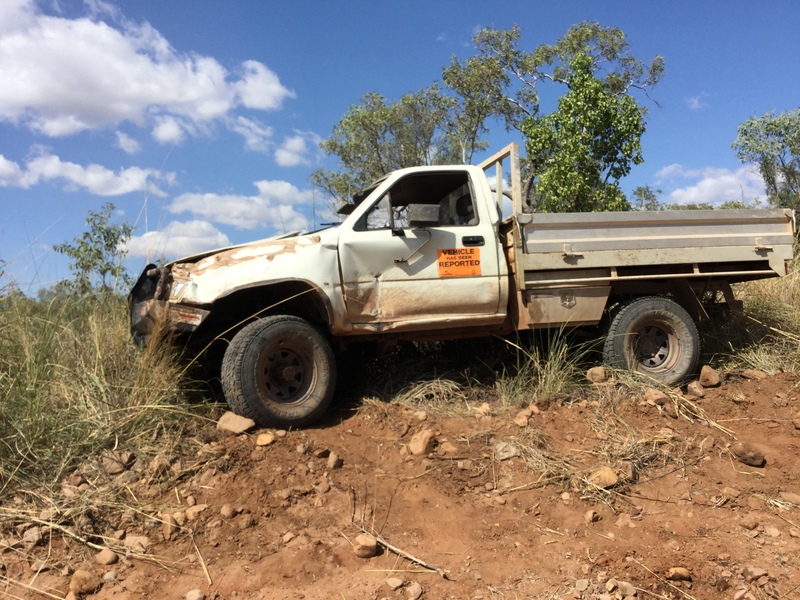 We left El Q on 7th June and headed off along the Gibb River Road, crossing the Pentecost River was to be our first test of the day. The longest water crossing we had done to date. It was over big, round rocks, bumping the car from side to side but not harshly. Neither of us realised this River was tidal and it was lower than the day earlier when we had come out to test it. Photos don’t really do it justice though, sitting in the car was better. Home Valley was our destination for the night. Temperatures were still high thirties and when we arrived there was a period of sitting around waiting for a spot to become vacant. We took a walk around the facilities here, while we waited, which were quite interesting and welcoming but the heat didn’t make it very enjoyable. By the time we were allocated our site we were losing our patience in the heat. There was very little shade and it was very dry and dusty. As we set up Murray discovered that our battery charger had died and even though we had paid for power to fully charge our batteries, $20 extra, it was now pointless. He would have to put the solar out to maintain charge to the batteries. 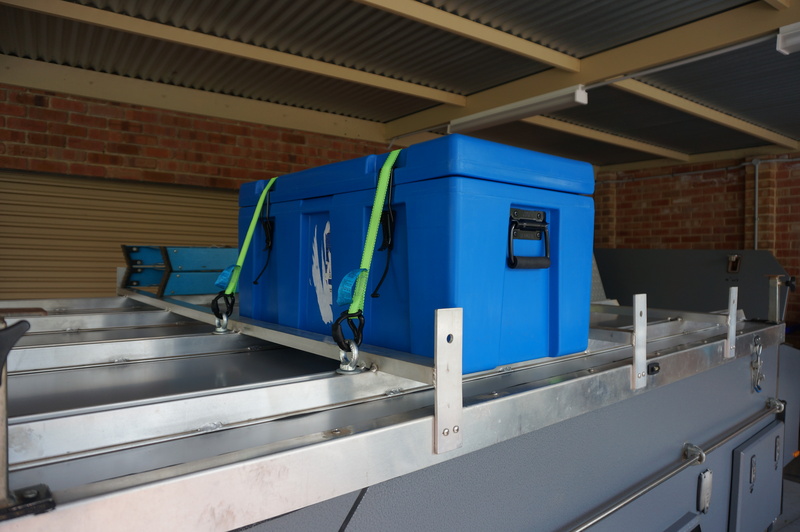 The pressure was taken of though by the fact that the two fridges were able to run on 240 volt power. The high temperatures day and night were increasing our power usage as the fridges had been cycling more regularly so keeping batteries topped had become harder on just solar. This isn’t a problem when we are on the move as the car charges them at a faster rate. There was a pool here but when we got in to refresh and cool off the water was like a warm bath. We met up with a couple, Sharon and Dale, around the pool area, who were from Fairy Meadow near Wollongong, and had a great chat with them which helped our spirits at this stage. 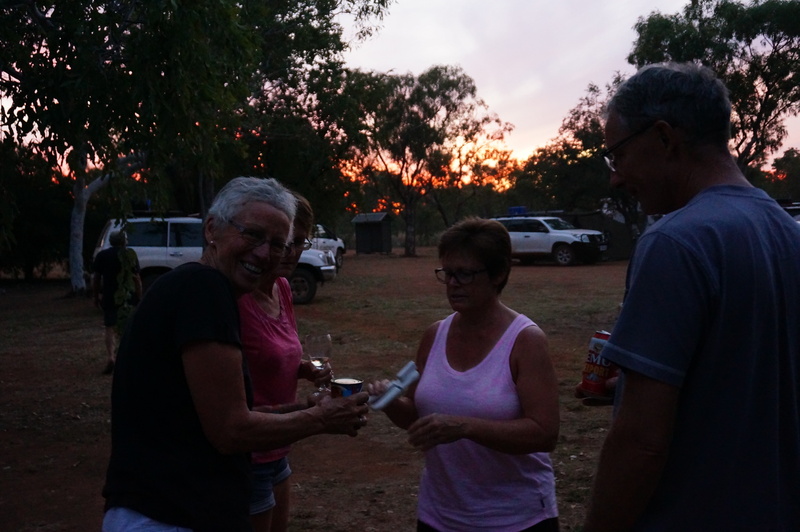 After a cool shower we headed to the river camp to watch the sunset and ran into our friends from Lake Argyle, Rhys and Jayne. We had a lovely catch up as the sun set and the salt water crocs basked in the evening warmth on the riverbank of the Pentecost. This, we discovered, was a much nicer area to camp with more shade, good ablution blocks and plenty of room, would recommend it. After dinner we took a further look around Home Valley, in the cool of the evening. We watched Vic with his whipcracking and just took in our surroundings. It is a pretty setting here especially with all the lights at night. The next morning, 8th June, we set off for Ellenbrae Station. Not all smooth sailing though. It was 105kms between these two places but it took longer than anticipated. The boost pipe decided to play up again due to all the corrugations possibly causing extra car movement. We had aired down and were trying to maintain our speed to 70/80 kms to sit on top of the corrugations, because any slower and these are accentuated, yet it was still rattling our teeth. After the third time of the clamp loosening off and Murray thinking of taping it we lost it completely, but we had one spare left so he put it on and taped it just incase. There were regional burn offs happening on the edges of the roads and the heat of the day was intense one again. We pulled up once or twice just checking everything, making sure the repair was holding. Then a stone flew up out of nowhere and hit the windscreen. Odd we both thought as there was no one else around. Murray got out to check things and found that the light bar had let go and was dangling. The bolt had obviously been what had hit the windscreen earlier. Bungy straps came into play to hold it on till we got to Ellenbrae Station which now couldn’t come quick enough. We were both on tenterhooks all the way and were so happy when we arrived at our destination where we found several fellow travellers had had problems, ours being minor in comparison to most. We booked in and having been told that the Devonshire teas here were the best, we ordered two, sat down to relax and thoroughly enjoyed. Logan, the boss had spare parts for Murray to take advantage of and sold us two clamps, for a safety measure but had no bolts to fix the light bar. This map shows distances between each stop and the length of this road, 680kms. Thank goodness this was a beautiful bush camp. Lots of birdlife and lots of character in the surroundings. Plenty of room to spread out on our site. A fantastic bathroom with a toilet, bath and/or shower which used to have no screens around it and a donkey to heat the water. There was a lovely barbecue area with table and chairs. We set up and Murray worked on the car removing the light bar, as we don’t drive at night, checked all the tyres and everything else to put ease to his mind. Then it was let’s check out the swimming hole and cool off…a bit of a walk later… And, I’m not swimming in there says me.mThis waterhole had a sign that said ‘swim at own risk’. On a tree is a pair of shorts and on the ground are two noodles…who left them here and where are they now?? What happened to the owners of these things on the bank?? No way was I getting in there…Murray, of course got in and cooled off but didn’t swim as even he was unsure of his surroundings and what may be in the water. After a wonderful shower it was happy hour which was peaceful and ended up being spent with a couple who had car and caravan problems that day as well, Jen and Eric. We met up again with Gaylene and Kevin, whom we had met at El Q but they were having a major car problem with water in petrol issues. Not sure how they’ve gone since then, will have to ring them and check. Manning Gorge was our camp for the 9th and I have to admit I wasn’t feeling comfortable with the climb into this gorge. 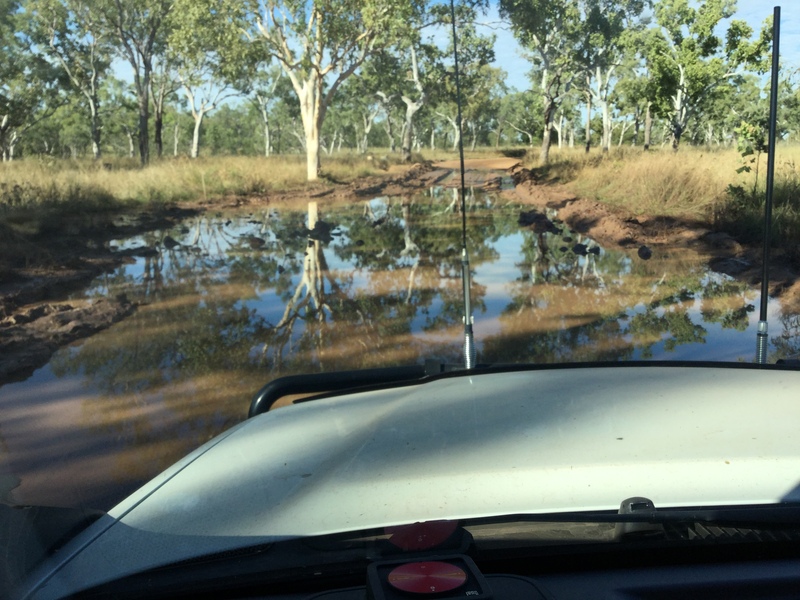 We checked in at the Mount Barnett Roadhouse and crossed the muddiest water crossing we have ever encountered. 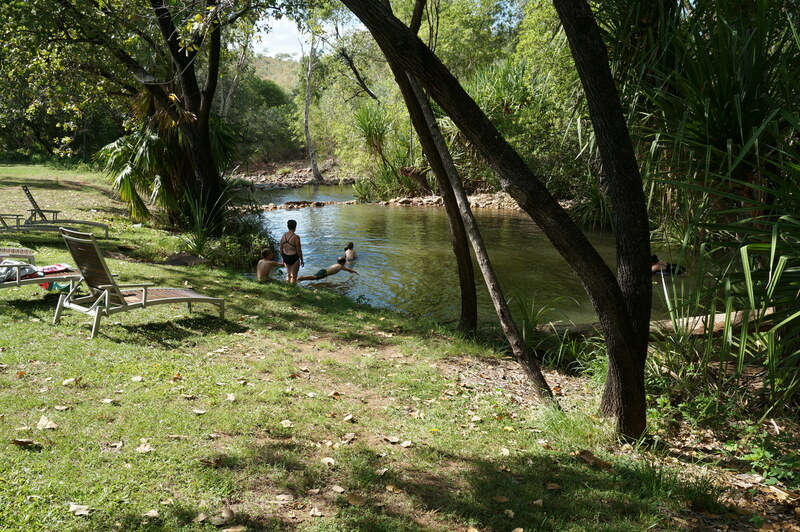 When we arrived and set up we went to the waterhole for a refreshing swim and the water here did not disappoint. It was cooler than most and very clear. Talking to lots of people including the caretaker I decided I would not walk this gorge as it was more challenging than most. After a swim, shower and a most amazing, colourful sunset we settled in for a quiet and restful night. We ran into some people here that we first met at El Q, Gaye and Richard, they are from Albion Park, it really is a small world. Heading to Bell Gorge tomorrow, staying at Silent Grove. This is truly a fantastic part of the country we are passing through. 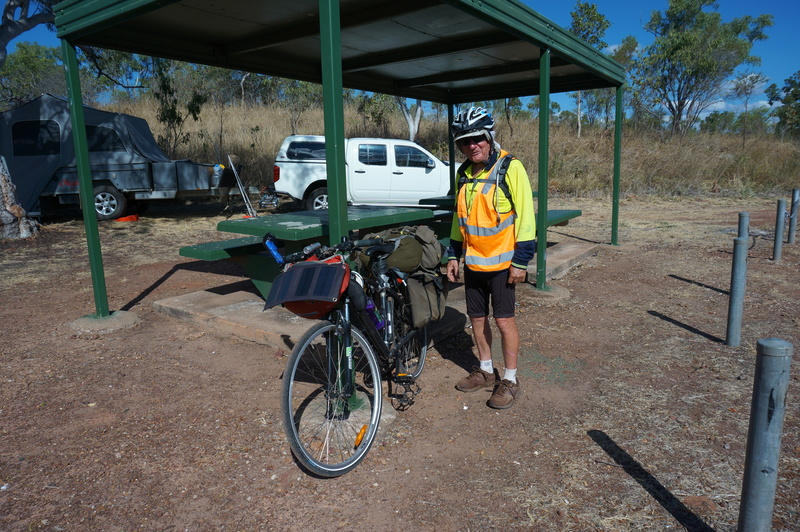 About 50km out of Kununurra was the turn off to the Gibb River Road. Anxious and excited. What did this road have in store for us? We were about to find out. El Questro or El Q, as it’s known out here, was our first stop. We aired down and began the trip in. Three river crossings, but no big challenges, before we entered the gates where we would base ourselves for the next four nights. As we went unpowered we had to have sun for solar and setting up in this heat was unbearable, it was 37 again and quite distressing on the body. We needed our awning up this time for shade for ourselves so it takes about ten to fifteen extra minutes. Settled in and off for a swim down at the creek to get our core temperature down. The place was on fire while we were there with people turning up left, right and centre, it was just so busy all the time. They’d roll out each day early and then roll in by lunchtime and fill the place up again. Constant traffic and dust and the heat was always relentless. We had the same neighbours for about two nights in a row then it changed but we always had someone friendly and worth getting to know. All of us had our own stories to share either of where we had been, how we got here or where we were going. Hearing other people’s tales is all part of the learning. The swimming hole at El Q near the restaurant. Getting up each morning wasn’t a problem as the local donkeys woke everyone in camp around 5ish but we find that we are awake early anyway because of the fact that the sun is up so early. Walks were best done early in the cool of the morning so we would set out by 7.30am most days. Within El Questro there are several self guided walks and Gorges-Emma, El Questro, Amalia and Moonshine, along with Zebedee Springs and Champagne Springs, and four wheel drive tracks to lookouts such as Saddleback Ridge and Branco’s which is part of Explosion Gorge. Picking one or two gorges isn’t easy but after talking to people we did Emma and El Questro, visited Zebedee Springs and drove to the lookouts where Murray continued to improve his four wheel drive skills and confidence, much to my enjoyment…not, although I’m not as white knuckled as I once was. I can now release my hands and take photos. These guys woke us each morning. Eeaaw. Emma Gorge is outside the El Q gates and back up the road a bit, you can’t camp there as its all resort style accommodation with excellent facilities. This was day one of our stay, Saturday, and we were looking forward to our walk. The gorge walk was invigorating, not too long 3.2km return, but partly shaded and through some rainforest in sections, it meandered along Emma Creek which we had to cross twice. There were plenty of large boulders to negotiate with about the last hundred metres of the trail becoming steep and slightly difficult. Turquoise Pool was the first swimming section, some stop here due to difficulty of the track after this. Pushing on, the main pool and falls could be heard and we couldn’t wait to cool off. Temperatures of the pool vary from as low as 15degrees to 25degrees. At one side there is a thermal spring that seeps water through cracks at the base of the cliff and you could feel the difference near this area. We spent and enjoyed a couple of hours here, it was well worth the walk and climb and not too difficult. An very atttracive spot. Our neighbour, Nathan had also made the walk in and obliged us by taking our photo. As it was so hot again we returned to camp for the afternoon where we enjoyed some lunch and a cool down in the waterhole. Saturday evening was barbecue night at the station with beef, barramundi and chicken plus lots of salads and desserts. We headed up early for happy hour and a chat with Nathan. Dinner was superb the meats and fish were perfect. Entertainment was provided by singer/guitar player Chris Matthews and some whip cracking by Christian, which was a fundraiser for the RFDS. It was an awesome evening, we chatted lots and as we left I realised I had had a few too many drinks which left me a little unwell when I got back to camp. I wasn’t too happy that I lost all my dinner that I had enjoyed so much. This of course gave Murray something to laugh at me about the next morning as I was a little seedy and not so adventurous so we headed to Zebedee Springs for a freshen up in the thermal waters. A short walk in and we found this natural oasis at the base of sheer cliffs with lots of little pools to lay back and relax in for a few hours. It was so lovely and refreshing, just what I needed. We spent the rest of the day relaxing at the waterhole back at the station and getting some housework done, like washing. In the late afternoon we headed out for a four wheel drive experience to Branco’s Lookout. This track had it all with an extremely rocky water crossing, long steep climbs and one amazing view when we reached the top, looking out over the Cockburn Ranges and the Pentecost River. Breathtakingly beautiful. Glad we went up before sunset though as it was a hairy drive which I wouldn’t have wanted to do in the dark. It took us several attempts to get across the river crossing as we came back because everyone else had decided to come up for sunset and we had to keep backing up at the second part for them all. Not many had their radios on or used common courtesy for others trying to cross. Very frustrating at times. Monday morning we headed out to take the walk into El Questro Gorge. On the way we stopped off and took a short walk into Moonshine Gorge Waterhole but didn’t do the gorge walk as the waterhole was only five minutes from the car park. At El Questro Gorge we only planned to walk to the halfway pool which was a 2.6km return walk as the MacMicking Pool at the end was very difficult to get to. Most of the walk into the gorge was shaded by rainforest and the walls of the gorge. Creek crossings, big boulders to climb and lots of rocks underfoot this gorge walk had it all and was certainly a challenge to my short legs at times, I often had to sit down and slide over a boulder. Lots of climbing later we came into the halfway pool section which was excellent for swimming. The water was so cool and clear with plenty of rocks to rest on. There was a huge boulder where Murray had to shimmy up between the cliff edge and it to get up on top then slide or jump off the other side into the pool. This was where you could also climb up and travel on to the other pool but it was challenging, to say the least, and a lot further on. We enjoyed our rest at the half way pool and headed back out an hour later. The afternoon was filled with swims back at camp and relaxing in the shade. In the early evening we headed to Saddleback Ridge for some fourwheel driving and a sunset. It is a 7km round trip but takes a while to do. Although the views are breathtaking on the drive up the road is very steep, narrow, has plenty of loose stones and steep hairpin bends on which you have to do three point turns. It was a nail bighter. When we reached the top I was very happy but knew we still had to drive back down which did not thrill me but the view made all those thoughts go away. It was breathtaking and offered a 360 degree view over the Wilderness Park escarpments with the Station and the Homestead in the distance. 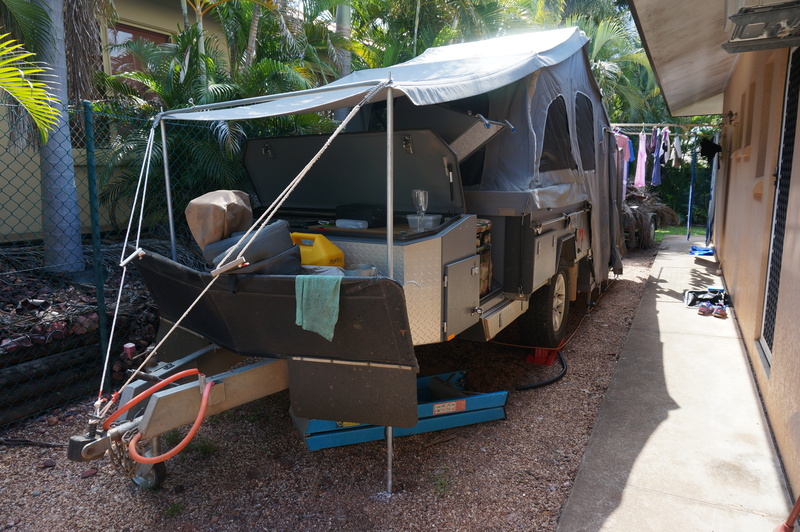 We have seen so many different styles of campers, tents and vans, lots of travellers from all over Australia and other countries, both young and old, and watched people concoct meals on many styles of cookers. Rooftop tents are very popular especially among the European tourists. Across from our camper the last two nights we had German tourists in two tents and a rooftop, three men and two women, late sixties to early seventies. When setting up their tents one of the women was inflating her mattress by mouth and while watching her we realised it was a self-inflating mattress, not too sure if she knew. Cracked us up. The women went for a swim. One returned in her swimmers, went to the car, not trying to hide and directly opposite where we are sitting. She begins to take off swimmers, puts on bra, struggles with getting undies on and we can’t help but see all. She then wanders around camp with the other one who has brought the washing back from the line in their undies with tops on but no shorts. Together they fold washing having a great old chat. They wander back to the laundry still no shorts over undies, neither lady was petite. We just sit there and laugh. Gotta love some people. Someone didn’t make it one night. Took a bend too fast. Packing up was best done early because it heats up so quickly here, we were up around 5.30 Tuesday morning, even then it was already 27 or above. This place was amazing, challenging and rewarding. We have had a wonderful time. The water has been so beautiful, cool and clear. I have challenged myself on all the walks and feel quite satisfied and proud. Bring on the next part of this road. 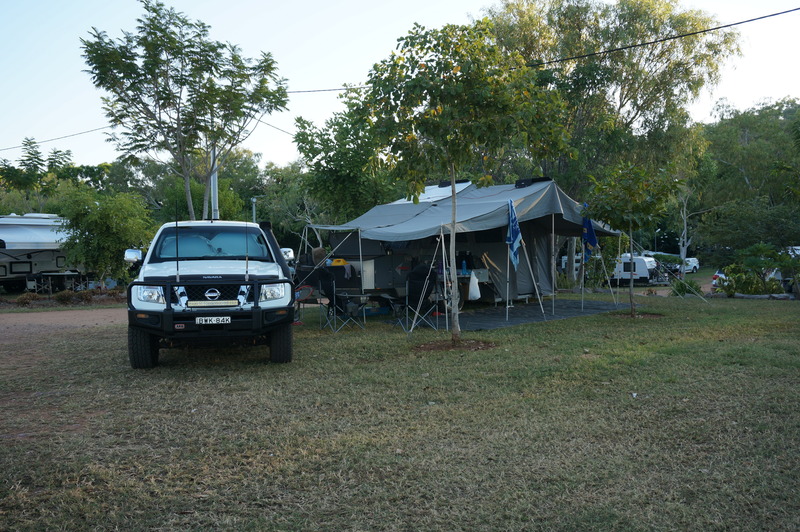 Next stop for us was a couple of nights in Kununurra from Wednesday 1st June to Friday 3rd June, we pulled into Hidden Valley Mirima Caravan Park. Power, shade, fruit and vegetables were what we were looking for in this town and we got the lot. Temperatures were still high thirties. The caravan park was quite a large one with plenty of shade. Upon setting up we found we had picked up some hitchhiking ants the night before at our free camp and also had a resident gecko along with us from Darwin so these all needed to go. The gecko wasn’t easy to catch but the ants got hit hard with ant spray. As it was State of Origin night a television screen had been placed in the open camping area for everyone to watch the footy under the stars. After a lovely swim and a BBQ dinner we headed in that direction with our drinks. What a shame it wasn’t a better result though. 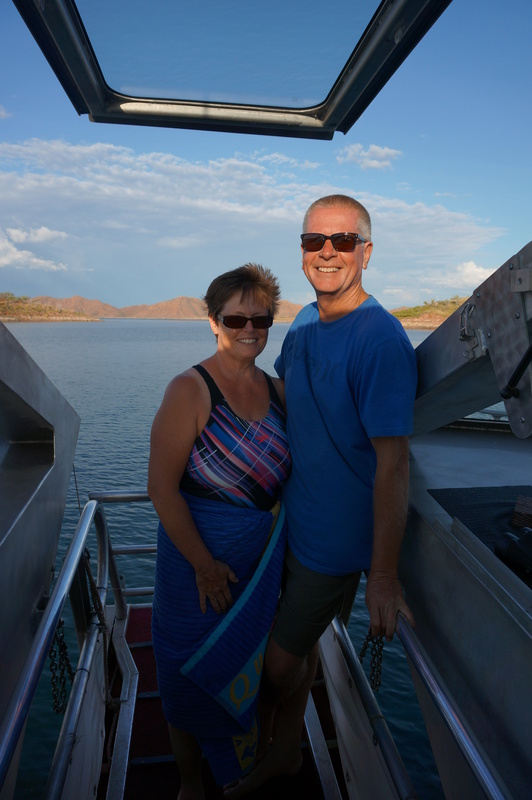 Thursday we did a spot of touristing around Kununurra and discovered there’s a bit to see and do here. 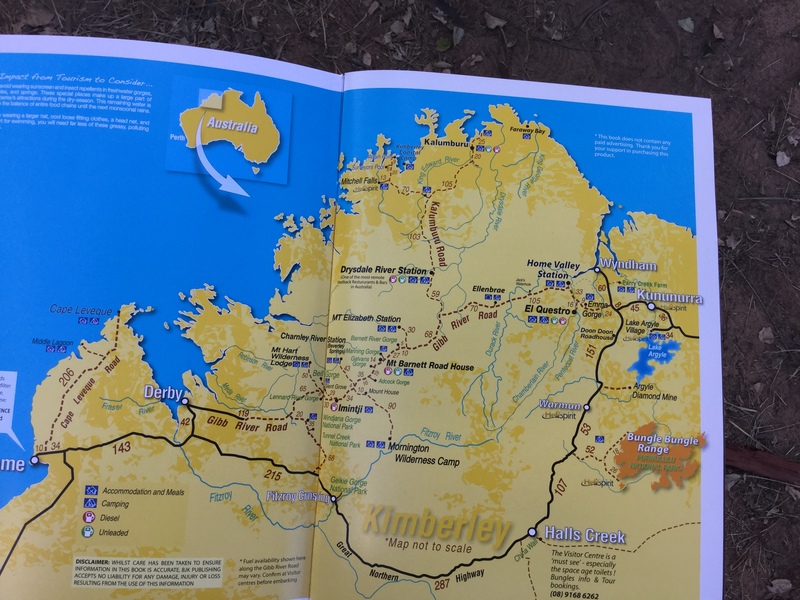 Kununurra is We took a lovely drive to Wyndham, which is about 100kms up the road, to a lookout which shows where the five rivers being Pentecost, King, Durack, Ord and Forest all join with the Cambridge Gulf. This landmark was named the Bastion by Captain Phillip Parker King back in 1819. 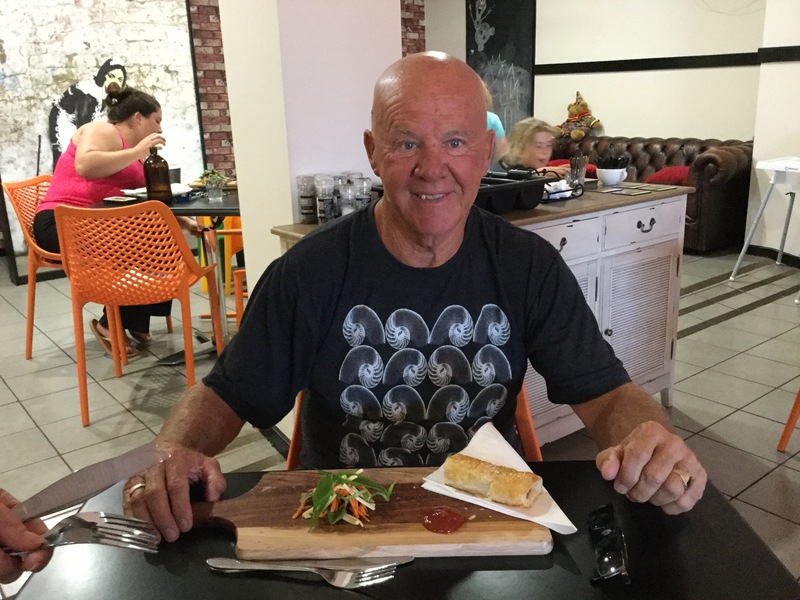 While in Wyndham we stopped into the Rusty Shed Cafe for a tasty morning tea and thoroughly enjoyed the atmosphere there. Our trip back into Kununurra took us out to the Sandalwood Factory where they grow Indian Sandalwood which reaps $100,000 per tonne. Of course, they make incense from it, soaps, oils and it is also the base to a lot of famous perfumes worldwide. This is a huge agricultural industry up here and fascinating to learn about. There is a wide variety of agriculture within this region, that continues to expand, along with the sandalwood such as chai, chickpeas, mangoes, kidney beans, limes and the list goes on. All this area is irrigated by the Ord River Irrigation System which we learnt about at Lake Argyle. We found a lovely beach area on the banks of the Ord River diversion dam where a group of older ladies and gentleman had decided to play on a rope swing and were having a funny old time trying to climb the tree then swing into the water all laughing their heads off. 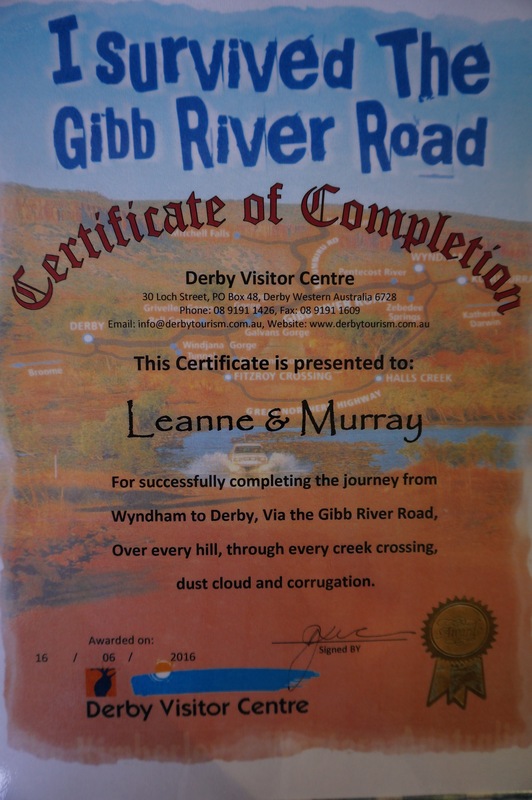 We knew we wouldn’t get to talk with the boys or anyone else for a couple of weeks because we would be on the Gibb River Road till we reached Derby so we rang them for a chat, as the Internet was too slow for face timing, also we contacted Murray’s mum and dad and Aunty Helen. While we were sitting outside chatting we heard a strange noise inside like something had hit our fan, we looked in and there was a gecko tail flicking around the place, it must have crawled into the fan, there was no sign of the gecko itself anywhere that night. Next morning we found it was still alive, although it looked stressed, and released it into the wild. Poor little fellow. 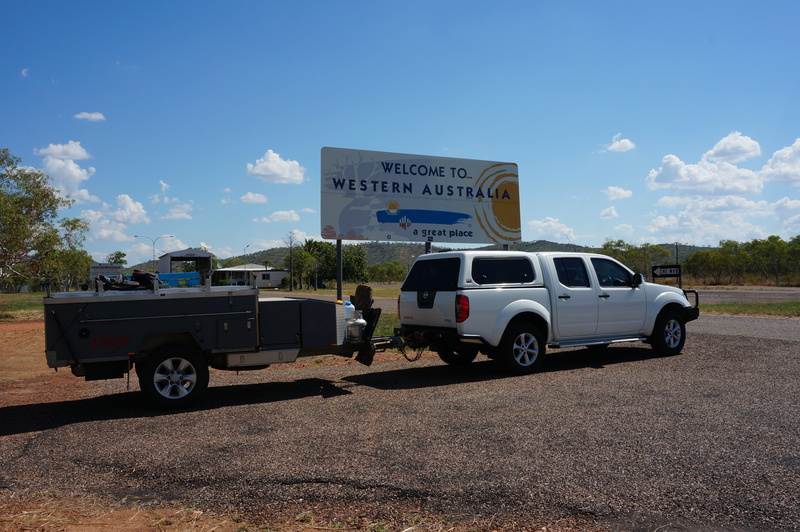 There was more we could have done in Kununurra but it was a regroup for us, some internet for a day, family contact and shopping before the next step on the road of adventure. Time off the road for a few days was just what we needed and got while in Darwin. After being on the road for a few days we were looking forward to a rest with more than a one night stopover. When Murray rang his cousin Sharon in Darwin to see if we could visit sometime she suggested we stay with them as they lead a very busy life and that way we could actually get some rest and catch up with the Forsyths properly. 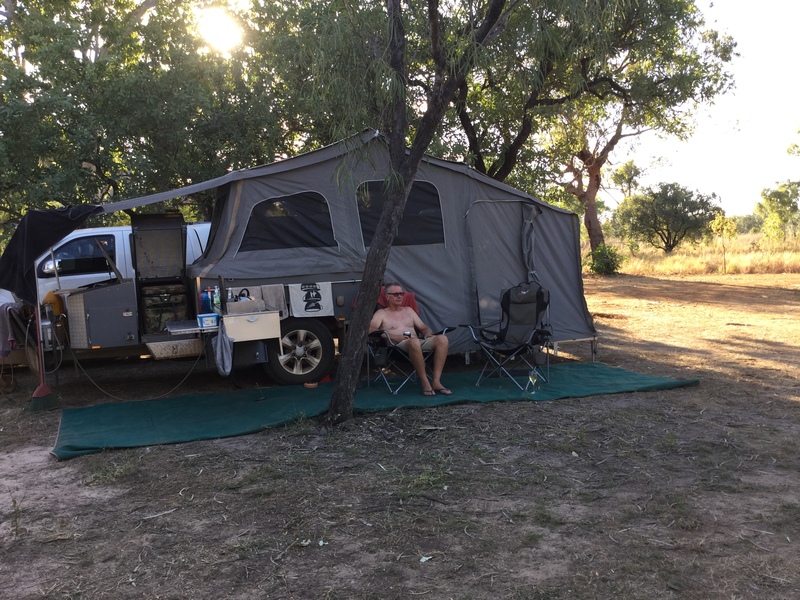 After arriving in Gunn on Monday 23rd May we headed around to the Forsyth’s, we were happy when our trailer fitted up the side of their house quite comfortably as this meant we could stay with them. Being here was like a resort, hence we called it the Forsyth Resort. Everyday we took a dip in the spa pool, enjoyed drinks in the shade with no ants crawling on us or in the trailer, and we were treated to culinary delights that sat quite well on the palate by Neil, Masterchef extraordinaire. Each day we got cuddles from the dog KT, she loved sleeping outside the camper and would try to get in once she knew we were awake, she would stick her head in when we unzipped the door and was hard to get out. We got snuggles with the two cats Stewie and Lexi, who warmed to us very well and are very spoilt but sweet little things. It was fantastic to have the privilege of staying with them as they truly do have the busiest of lives with netball. Sharon and both girls Emma and Clare do training, coaching, playing and umpiring in this sport over four nights of the week, the girls also have hip hop dancing twice a week and Saturdays are netball again for the whole family in some capacity. Neil is the run around man in the evenings and afternoons and as I said before the Masterchef as well. He loves experimenting and even though we were happy to cook for ourselves he loved the fact we were only too happy to taste test for him. Tuesday saw me get washing up to date once again and do a recon of what we needed to take for the rest of our trip into WA. We couldn’t stock up on too much fruit and veges as we had to declare them at the border. This was a list making day and I also caught up on a blog or two. Murray was able to repair our water tank which had been damaged on the Plenty Highway and we got the car clean inside and out. I also went to Sharon’s hairdresser friend and got another good haircut. That’s two out of two I am happy with, next one will probably in Broome. Even though we were in Darwin to have a long overdue catch up with the family they were only too happy to recommend things for us to see and do, if we felt so inclined, through the day while they were away. Wednesday, on their recommendation, we went into Darwin for a few hours. Darwin is a lovely city not huge like Sydney or Melbourne and quite easy to get around. One of the things suggested were the World War II oil storage tunnels. These were built after the newly completed above ground storage was bombed during the Japanese invasion of Darwin, but due to water sealing issues and the end of the war they were never commissioned. It was fascinating to read about and look through these huge tunnels and to realise just how much of an impact WWII had on Australia in the Top End. After we went for a walk around the waterfront we had lunch and a quick look through the shopping mall then we went for a scenic drive around the town and out to East Point along the beach front. Such a pretty place but it was very hot so we headed back for a swim at our resort. 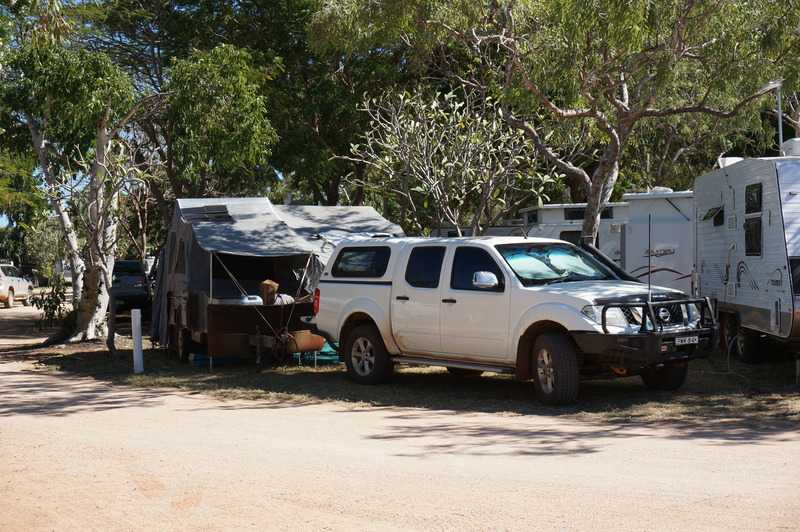 Thursday we decided to head to Litchfield National Park for a look around. We drove back down the Stuart Highway, about 130kms, and turned right into the park where our first point of interest was the Magnetic Termite Mounds. These are fascinating, built on a floodplain, made by these tiny termites, that aren’t found anywhere else in the world, which have constructed them to align in a north-south position meaning that one side is always in the shade allowing the temperature inside to remain cooler for its residents. They are a flatter shape unlike the other mounds which are made by the cathedral termite, therefore are constructed in a cathedral style shape. From here we headed to Florence Falls for a walk and swim. From the car park its an easy 150 steep steps down to the plunge pool at the bottom of Florence Falls. A picturesque area out of the heat of the day, refreshing and relaxing to swim in after the walk down. We sat on the rocks after our swim and enjoyed our lunch then took the 1.5km walk back out along Shady Creek. This area goes from a tropical paradise to a hot Savannah landscape as you climb and meander along the banks of the creek. By the time we returned it was 36 and we were once again lathered in sweat ready for the next swim at Buley Waterhole. Back in the car and up the road a few kilometres then about a 100m walk in to find another picturesque and refreshing swimming hole or rather several of them. If you sat in a little hole in the third pool you got a lovely massage from the waterfall. What more can I say about this place other than magical, we were so glad we came here for the day. 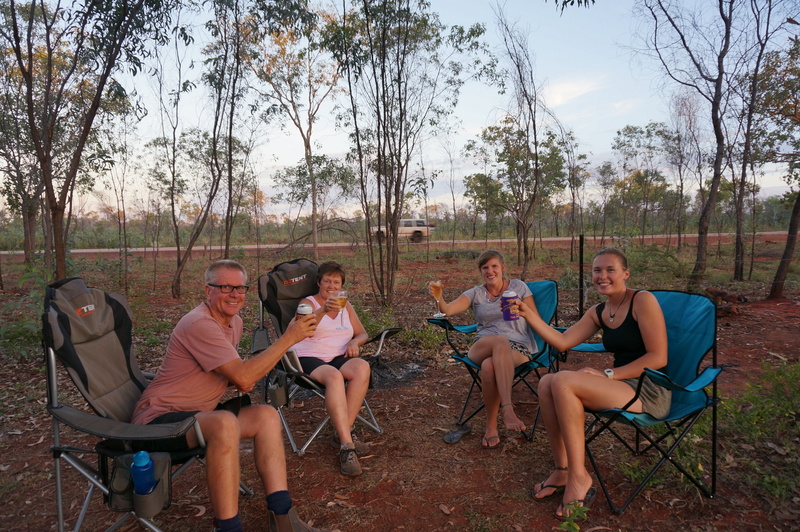 Litchfield NP has a lot more walks and waterholes, you can camp in there too but we were ready to return to our resort for another swim in the pool and a drink or two. Friday was shopping, ticking everything of the lists and finishing another blog before we left here. We were looking forward to the evening as all the family was home together for the first night all week and Neil was cooking lamb on the spit. Mmmm. Friday night for this family is footy night, AFL. A big night was planned with nibbles, drinks, amazing lamb, wonderful company and swimming. Excellent night had by all. Although we were looking forward to heading to the West we were sad to say goodbye to another great week with wonderful people. Thanks Sharon, Neil, Emma, Clare and our little furry friends. Saturday we headed for another free camp at Matheson Rest Area. We ran into a little German man who is travelling alone on a pushbike, we also saw him at Daly Waters. He is about eighty and he likes to do quite a few kilometres a day. He was just heading off to do a couple more hours before he rested for the night. The next day we saw him 70kms up the road from where we were. He was unreal. Toilets herewere drop but ladies was nearly full so a bit on the nose and we ended up with lots of ants on and in the trailer but it was quiet and we certainly weren’t lonely as it was full. Old mate set to go again. Camp at Matheson Rest Area. 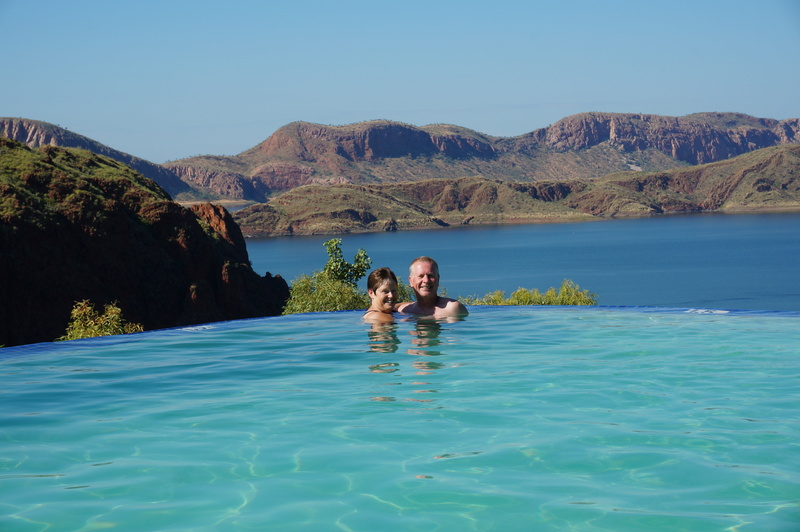 Sunday we will cross the border to WA and spend a few days and nights at Lake Argyle.